I guess there's something about elevon controlled planes I like. Might have to do with my first trainer plane being the elevon configured Delta Ray. 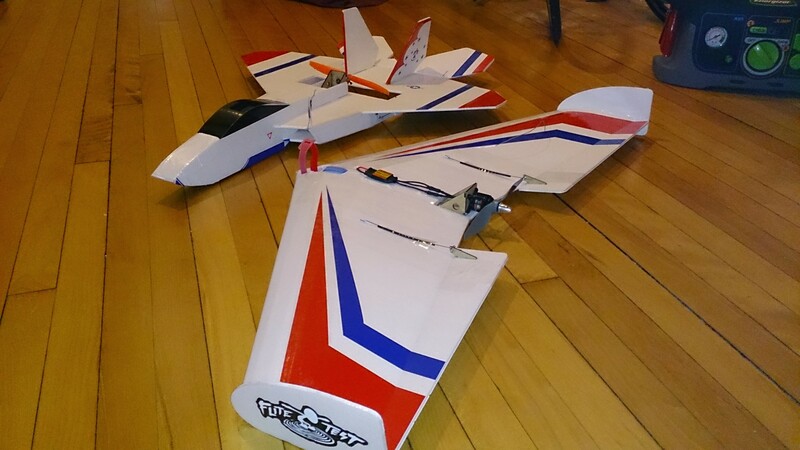 I saw the Versa Wing as the perfect bigger brother to the Delta Ray, especially coupled with the powerful "The Beef" electronic package from LazerToyz. I'm still too new to the hobby to want to risk sourcing everything myself, so having the kits available to purchase is brilliant. I learned / relearned a few things from my flights. The "overhead" launch method is easy and a great way to launch a wing! Having the high rates made for a dizzying video, but is great in a smallish flying field surrounded by trees. When you think it might be too windy, it is too windy for any fun flying, especially in small areas. FT VersaWing speed build kit. http://lazertoyz.com/ "The Beef" electronics package.